Prince Harry has said one of his duties as an uncle to his new nephew Prince George is “to make sure he has fun”. 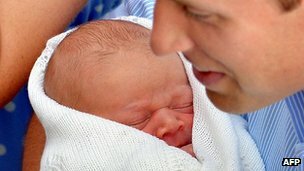 Harry said that he had already cuddled the prince, who was born on Monday and has been named George Alexander Louis – Prince George of Cambridge. Prince Harry said it was “fantastic to have another addition to the family”, and that the newborn “was crying his eyes out” when he met him. Prince George is third in line to the throne. Prince Harry – who is now fourth in line to the throne – spoke while on a visit to a photographic exhibition in London documenting the work of his Africa-based charity Sentebale. The charity helps children living in Lesotho who are orphaned by the country’s HIV/Aids epidemic. When asked what his mission was as an uncle he replied: “To make sure he has a good upbringing, and keep him out of harm’s way and to make sure he has fun. Prince George was born at 16:24 BST on Monday at the private Lindo Wing of St Mary’s Hospital, Paddington, where Prince William and Prince Harry were also born. The Duke and Duchess of Cambridge left hospital with their son on Tuesday evening, staying overnight at Kensington Palace. The Queen spent 30 minutes with her new great-grandson on Wednesday. At a reception at Buckingham Palace on Tuesday evening, the monarch said she was “thrilled” at the arrival of her third great-grandchild. The duke and duchess left Kensington Palace shortly after the Queen’s visit and were driven to the home of the duchess’s parents Michael and Carole Middleton in Bucklebury, Berkshire. It had been expected that the couple would want to spend time at Middleton family home but it is not known how long they will stay. Prince William has two weeks’ paternity leave before he is due back at work in Anglesey where he is an RAF search and rescue pilot.